We all have lived past lives. We all will live future ones. What we do in this life will influence our lives to come as we evolve toward immortality. Dr. Weiss encourages this important recognition because recently he has not only regressed his patients into the past, but has progressed them into the future. And what they have discovered is that our futures are variable, so the choices we make now will determine the quality of life when we return. Samantha, whose failures at school were overcome when she revisited her life as a Greek architect and later saw her future life as a great physician. Hugh, a psychic, tortured in the Middle Ages as a heretic, whose journey to the future brought him peace. Gary, whose glimpses into the future evaporated his depression and thoughts of suicide. Christina’s past life and future memories enabled her to heal her relationship with her father and to finally find professional success and personal happiness. Evelyn was able to release her fears and prejudices after reliving a past life as a Nazi officer and a future life as a teenage Arab girl. Paul, whose love of Alison transcended past and future, transforming his current life and helping Alison to overcome a dangerous disease. 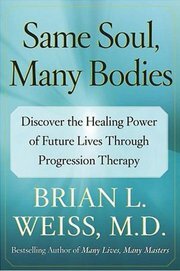 Same Soul, Many Bodies is a revolutionary book, building on Dr. Weiss’s discoveries about the past, a book that will take his millions of readers into an individual and collective future that they themselves will create. In the process, their present lives will be profoundly transformed, and they will find more peace, more joy, more healing.